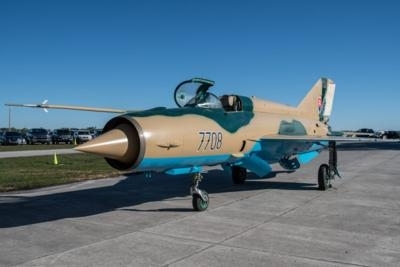 One of the most popular supersonic jets in aviation history, a Russian Mikoyan-Gurevich MiG-21, has a new home at the Aerospace Center for Excellence (ACE). 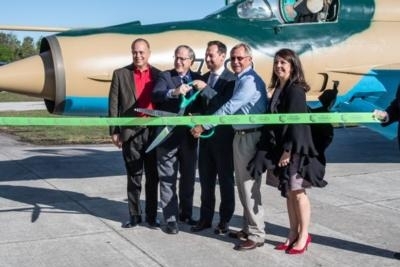 Draken International donated the single engine jetfighter to Aerospace Discovery at Florida Air Museum, a key component of ACE. The unveiling and ribbon cutting ceremony took place during the 6th Annual Mayor’s Breakfast held March 6th on the Sun ‘n Fun campus. The Mayor’s Breakfast was attended by over 400 members of the business community interested in this year’s updates on Sun ‘n Fun and its Aerospace Center for Excellence initiatives as well as the keynote speaker from Draken International which is headquartered on the Lakeland Linder International Airport.